Download mod placeable Egg Pallet - Buyable v1.0 for FS19 | Farming Simulator 19 game. 1. 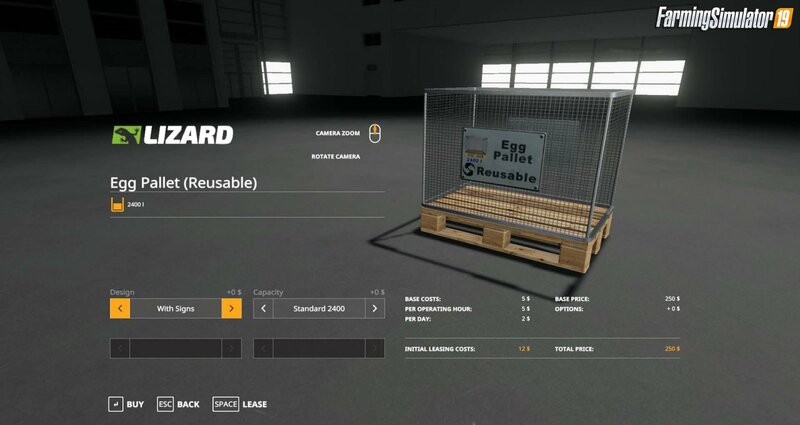 There are two types of buyable egg pallets in the store, the first is a single use pallet and the other is a reusable pallet. 4. A capacity option to set the amount of eggs packed into the boxes. 5. Animations for the filling and emptying. 6. Manually fill or auto-filling. Usage: Place the egg pallet in the egg box area of the chicken coop and it will fill to the set capacity, pallets can be left on trailers or placed on the ground, pallets can also be manually filled. When pallet is full take it to a sale point, if reusable the pallet will just empty as the egg’s boxes are sold, if single use, the pallet will disappear when all egg boxes are sold from that pallet. Installation instructions for «Egg Pallet - Buyable v1.0 for FS19» - Your first action will be to download the archive using the appropriate button below. Mods on our site are virus-free, and 99.9% have any extension other than “.exe”!